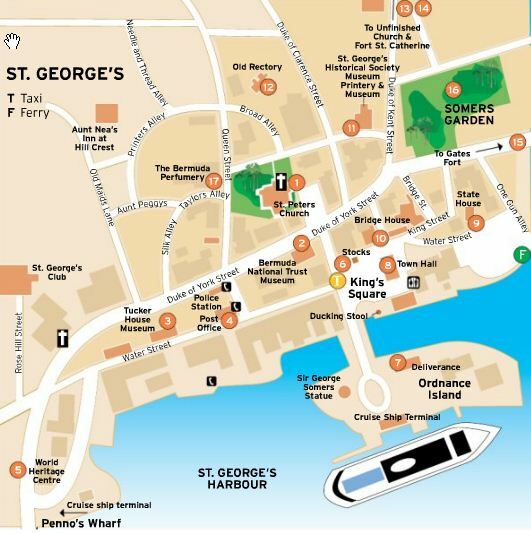 The map below shows all the important places and tourist attractions in St. George's Town. Just below the map, I have provided links for detailed information about all the places that are marked in the map including their pictures, contacts and opening hours. NOTE: The 'F' stands for ferry dock, but it has been moved to a different location. The ferry now leaves from Penno's Wharf near World Heritage Center (i.e. near location #5 on the map). Go west on Water Street and follow the "Sea Express" signs to get to Ferry Terminal. 1. St. Peter's Church at Duke of York Street. This is the oldest Anglican church in the new world and still in use. 2. Bermuda National Trust Museum at erstwhile Globe Hotel and at the corner of Duke of York Street and Kings Square. This building was built by Governor Samuel Day around 1700. The museum highlights Bermuda's role in American Civil War and also shows a video presentation titled "Bermuda: Center of Atlantic". 3. Tucker House Museum at Water Street. Henry Tucker, the President of Governor's Council stayed here from 1775 and his family lived in the house until 1809. Open Monday - Friday (8am - 5pm). Phone: 441/297-1610. 5. World Heritage Center near Penno's Wharf cruise ship terminal and at the western end of Water Street. It used to be the Queen's warehouse around 1860s, and now restored and renovated by St. George's Foundation to provide historical overview and highlights to visitors. You will enjoy the Orientation Exhibits Gallery and a short film titled "A Stroll Through Bermuda". You will see replica of Stocks & Pillories that were used to punish petty criminals in 18th century. There are holes on the boards through which the head and the limbs were inserted and kept locked for days. A popular place to take pictures. You will also see the Ducking Stool used even today to re-enact the history of ducking a gossiping wench into the harbor. It takes place at 12:30pm on Monday - Thursday and Saturdays (during high season, usually May onwards), and on Wednesdays & Saturdays at noon during low season (November - April). 7. Deliverance at Ordnance island across the bridge from Kings Square. This is a full scale replica of the ship built by Somers and his men to complete their journey to Virginia's Jamestown after their ship Sea Venture wrecked nearby. 8. Town Hall facing Kings Square. This is the meeting place of the St. George's corporation. 9. State House behind the Town Hall. This is the oldest stone building in Bermuda dating back to 1620s. This was the original seat of the Government. 10. Bermuda Heritage Museum at the junction of York Street and Water Street. It showcases the history and heritage of blacks in Bermuda. 11. St. George's Historical Society Museum at Featherbed Alley. Exhibits include carved cedar furniture, paintings and even an 16th century Gutenberg printing press. 12. The Old Rectory at Broad Alley behind St. Peter's Church. Built around 1699, it is now owned by Bermuda National Trust. You can get exterior views only. 13. Unfinished Church on top of Duke of Kent Street. This magnificent unfinished Gothic structure was getting built in 1870s as a replacement of St. Peter's Church. But the construction never finished due to conflict of interests and damaging storms. 14. St. Catherine Fort off Barry Road. This is a 19th century fort having many military exhibits of the period and offering great views of surrounding water areas. 15. Gates Fort: It was built in early 17th century. 16. Somers Garden: British Admiral Sir George Somers was the first to arrive in Bermuda in 1609 and initiated the British claim of the island. After his death, his heart was buried at this garden and his body taken back to England. The garden is open daily from sunrise to sunset. 17. The Bermuda Perfumery located at Stewart Hall, 5 Queen Street. For over 80 years they have been making perfumes at this premises. You can take a free tour and sample perfumes. 1) Bermuda Maps: Many other useful maps of Bermuda. Hello, Just to let everyone know that the "F" for Ferry on the town map of St. George's is at the wrong (old) place. The ferry now leaves from another part of town. Two weeks ago I missed the 10:30 am ferry to Royal Naval Dockyard. I was exactly where the map showed and I saw the ferry going out of the bay. The next ferry was at 1:00 pm, so I took the bus back. No hard feelings, it's part of the adventure... ah ah ah.